The benefits of urban forests for citizens and the most important results of the LIFE+ EMoNFUr project are introduced by our invited blogger Dr. Urša Vilhar, research fellow at the Forest Ecology Department of the Slovenian Forestry Institute. Forest, trees, parks and other green areas in urban landscapes are the irreplaceable part of the nature and our environment and especially important for citizens. Urban forests are important because they provide direct contact with nature to citizens, peace, relaxation, aesthetics and in Slovenia they are frequently visited for recreation. At the same time urban forests provide a great deal of ecosystem services that play an important role at insuring the health and improving the citizens’ quality of life. Namely, urban forests filter air, protect water quality, reduce soil erosion etc. In addition, trees and soils store carbon and reduce concentrations of carbon dioxide in the atmosphere. But the climate changes reduce the ability of urban forests to provide these benefits for the environment and people. In the LIFE+ EMoNFUr project a monitoring network was established to assess lowland forests in Milan (Italy) and Ljubljana (Slovenia). Monitoring of urban forests was set up at five study areas in Milan and two in Slovenia during a 3-year period. A network of permanent plots for monitoring urban forests was established in Milan and Ljubljana. The inventory of urban and peri-urban forests was preformed in Milan. 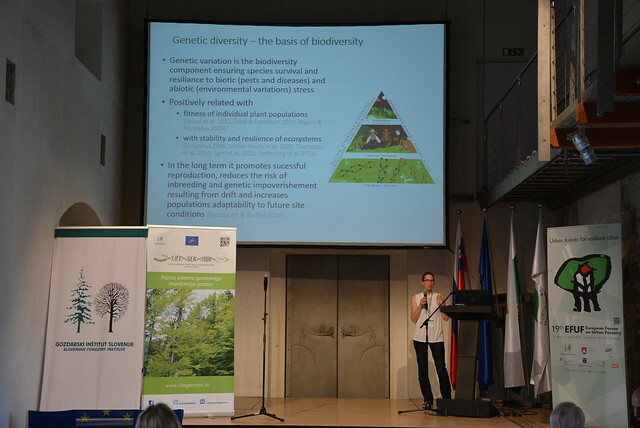 Researchers from the Slovenian Forestry Institute assessed diversity of selected plant and animal species, monitored insects and diseases of forest trees and their health status in Ljubljana’s urban forests. They have also analyzed soil pollution, monitored visits to the urban forest, assessed air pollution, analyzed tree growth, assessed forest inventory, estimated carbon stocks in trees and forest soils, monitored water quality and quantity from forested watershed, etc. A part of the LIFE+ EMoNFUr project monitoring network in the Landscape park Tivoli, Rožnik and Šišenski hrib for monitoring urban forests. The Forest inventory revealed that 1 hectare of urban forest on average sequestrated 138 tonnes of carbon in above ground, below ground and dead wood biomass. Tree health is especially important in urban areas – diseased or injured trees can pose threat to humans and property. Urban forests sustain the quality of drinking water sources and have a large capacity for retaining excess stormwater and melting snow. Forest soils in Ljubljana have proved to be well preserved and represent one of the cleanest environments in Ljubljana. In urban forests, the air temperatures during the heat wave are appreciably lower than in the urban center. At the same time urban forests serve as natural filter for pollutants, while in average 1 hectare of urban forest binds 138 tons of carbon. The most important EMoNFUr project results are the online guidelines and the Protocol for monitoring urban forests, which can be used by any city in Europe and around the world. The documents include a wide range of recommendations and criteria for detailed descriptions of ecological, environmental and social values of urban forests. Acknowledgement: the LIFE+ EMoNFUr project was financially supported by the European Commission’s LIFE – Financial Instrument for the Environment.